This year, we're going to approach this column a little differently. If there's one thing we value at Sonoma Academy, it's being open to others' points of view. With that in mind, we've decided to include "views" from many members of our school community in our bi-weekly blog. You'll hear from teachers, students, staff members (and, yes, occasionally from me!) about what is going on at school: projects, traditions, seasonal events, educuational issues. These many perspectives will give us all a whole new "view" this year. Each summer, as I wonder what I will say to you as we kick off the school year, I am fully aware that no one will remember much of anything I say past lunch….I know I can't compete with the excitement of the day, and yet I persist. I persist in saying a few words with the almost superstitious hope that they have the the tiniest “butterfly effect” on you and on the course of this school year. The “butterfly effect” is the notion that the fluttering of one butterfly’s wings can put a force into motion that has the potential to become something far greater, though we may never know exactly what or where. Each year, over the summer, in my readings and travels, I look for inspiration, for the slight flutter of wings that will set me into motion as I prepare to launch a new school year. One of the books I was most inspired by this summer was Educated by Tara Westover, her memoir of growing up the youngest of seven children in a survivalist family in rural Idaho. The family eschews formal education and though Tara’s mother teaches her to read using the Bible and the Book of Mormon, any further instruction is deemed unnecessary and even suspect. Tara decides to teach herself math and science well enough to attempt the ACT which she passes after a few tries. She manages, with no support if any kind, to matriculate at Brigham Young University and eventually will earn a doctoral degree at Cambridge University in England. What Tara must overcome and sacrifice along this journey, as well as the quality of her prose, takes your breath away. This self-creation is exactly what I wish for you this year and it speaks to the heart of our philosophy. We believe that education is about much more than imparting facts and skills; education is the process of finding your own truth, learning to articulate that truth, and learning to respectfully engage with the varied truths and experiences of others. Our goal for each of you is that by the time you leave here you will have the tools to construct your own mind and to create a life of truth. Your teachers will offer you clues and you will know when you see it in others, during community meeting and in classes, through senior speeches, discussions, and performances. But ultimately, it is up to you to find your truth. So watch for it. Catch it. Shape it and treasure it. Speaking of a single butterfly, did you know that a swarm of them is also known as a kaleidoscope? We are that kaleidoscope, Sonoma Academy. So many facets! So many beautiful combinations! As the year twists and turns and the colored bits shift and slide and fall, you will put into motion powerful forces that will shape your destiny and ultimately, I believe, that of the world. None of us can know at this moment, of all the things we will do this year both great and small, which will put into motion a force that transforms our life or that of someone else. There’s another quote from Westover’s book that springs to mind: “First, find out what you are capable of, then decide who you are.” The idea for a club you want to start? The new person you will dare to sit with at lunch. The exploratory you try. The books you might read. Any of these actions could change your life. There are endless possibilities and we don’t know which ones will turn out to have the most momentous effects. You’ve already taken the first step, the first twist of the kaleidoscope, the first flap of those little butterfly wings. You chose Sonoma Academy. You chose this community. You have disturbed the air and put a force into motion, and whatever that force may be, I can guarantee you that by the end of this year you will be different. It’s no secret that at Sonoma Academy, we love to dress up. From the Halloween parade around the gym to co-block lipsynch competitions to role-playing Humanities exams, many occasions at SA call for creative costuming. But it’s not only the students who enjoy dressing up; from time to time, our staffulty and parents like to try on some unusual clothes (and maybe some unusual personas, as well). SA’s biggest dress-up event of the year doesn’t occur during school hours; it’s Big Night Out, our annual fundraiser. This not-to-be-missed evening always has a unique theme, often inviting guests to try out some outlandish fashion for the evening. This past Wednesday, the new Broadcast Studio was transformed into a fashion shoot set. Using props from the garden shed, loaned frocks from Hot Couture Vintage in Santa Rosa, and a slew of fabulous accessories purloined from the theater department, our Marketing & Communications Interns photographed and filmed students, parents, and staffulty members—and yes, yours truly—modeling a variety of different looks to provide inspiration for BNO attendees. 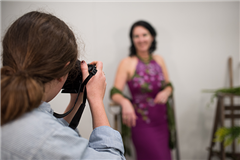 The photo is of Nina von Raesfeld '19 photographing her mother, Kathleen, as she models one of the many outfits designed to inspire you. SAPA volunteers and fashion-focused students assisted with styling and makeup, and we even had a surprise appearance from a very well-behaved and photogenic chicken! This year’s Big Night Out theme, The Secret Garden, lends itself to many different interpretations. From Victorian Garden Party to Venus Flytrap Femme Fatale to American Gothic to Compost Heap Chic, anything plant-inspired goes. Let nature be your guide, and you’ll nail the dress code. Of course, creative costumes and stunning decorations make Big Night Out a lot of fun, but we don’t just gather for a costume party. The funds raised at BNO allow us to provide financial aid, invest in sustainability features, put on incredible performing arts productions, and hire and retain incredible faculty, among many other things. This night of revelry is actually one of the most important events of our year, and the generosity demonstrated by our community at BNO is critically important to our growth and success as an institution. Keep a lookout for the “What to Wear to BNO” video, coming soon… and in the meantime, raid your closets and your potting sheds to pull together a home-grown outfit, or start shopping for some garden-glam garb. It isn’t your outfit that matters, it’s your support of our school and our future.